My mileages have dropped pathetically low–just 5 miles this week and last, and just 50 miles for the month. I had planned on running 20 miles a week after the Rochester Marathon and kept up with that goal for the month of October. But it has been the end of a large writing project this month–the project that kept me from staying current with this blog–and not the weather that has prevented me from keeping up with my self-imposed agenda. And that is always the problem with me when I am not training for a race. It’s all too easy to blow off a run and find any excuse not to get out there. Running, for now, has moved from the center to the edges of my life; when I was training, everything else was secondary to a run. At the moment, I feel heavy and sluggish. While I didn’t overdo my Thanksgiving feast, there has been no running to counteract the calories. So I am starting this blog back up to find some motivation to get back out there and finish the year with a flourish. By revisiting the successes of the second half of this year, I am hoping I will regain enough momentum to propel myself into next year, which promises to be even more memorable. When I last wrote in this blog, it was the middle of June and I had begun an ambitious program that would prepare me for the Boilermaker in July and give me a great start to my training for the Rochester Marathon in September. All went well on my self-designed program until the first week in July when the weather turned unbearably hot and humid. On vacation over the Fourth of July week, I got up early every morning to run, trying to find a little relief from the heat, but I would come back drenched with sweat and disappointed with my times. By the time I got to the Boilermaker start line on the morning of July 14, the sky was overcast and the temperature was in the high 60s, but almost immediately the sun broke through and the temperature shot up. My goal was to run 1:24, 6 minutes faster than last year’s PR, and even though the initial 9:02 split over the first mile up the Parkway put me very much on track, I could feel right away that I was struggling. Every stride seemed much harder than it should have, so I put my foot off the gas a little to save energy for the Golf Course hill. Ironically, though I ran a slow 9:48 up the hill, I finally felt like I was running well, and I flew down the hill and onto the Parkway as I had done in previous years feeling like I had broken through the barrier. But the boost was short-lived. No sooner did I get onto the shade-less concrete slab of Burrstone Road than my work rate began to drop off, and even the descent down Champlin Avenue couldn’t help me recover time or energy. My final time, 1:27:25, still beat my PR, but my disappointment at not making my goal time was immediately tempered when I eavesdropped on a conversation between two veteran Boilermaker runners while sucking down my first cold beer outside the Polish Community Club. Combined, the two of them had run 20 Boilermakers, and neither one could recall any one of those races that was hotter or more humid than this one. 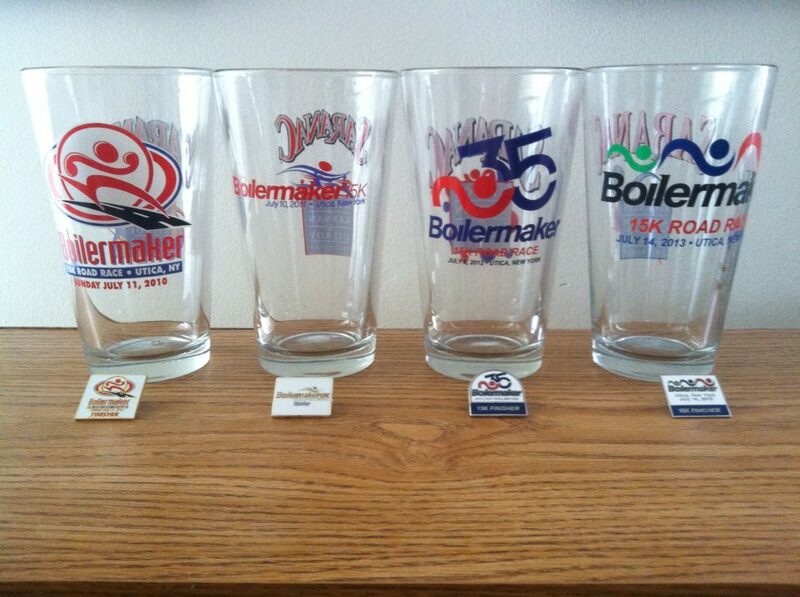 It was all the excuse I needed to go back for another cold one and celebrate surviving my fourth Boilermaker. This entry was posted in The Flat-Footed Fox and tagged Boilermaker, Rochester Marathon. Bookmark the permalink.